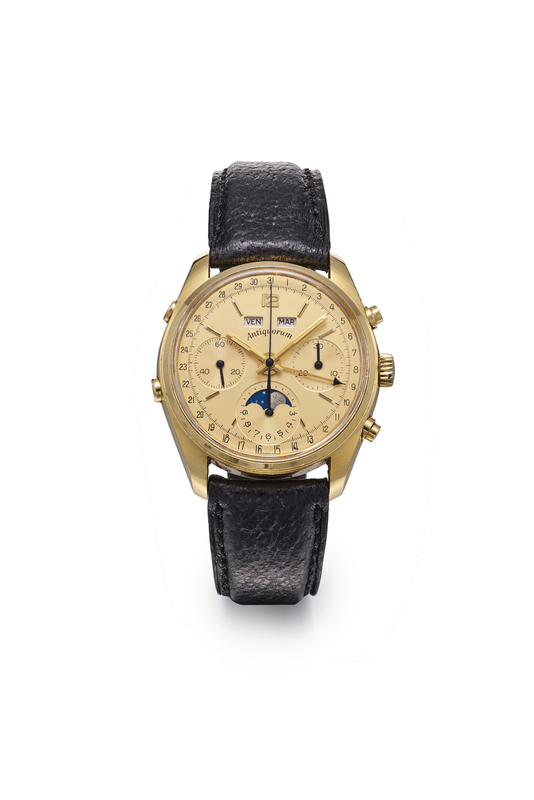 18K yellow gold, manual-winding, tonneau-shaped, gentleman's wristwatch, water-resistant with screwed case-back, subsidiary seconds at 9 and horological complications including chronograph, triple date and moonphases. The 1981 Antiquorum Watch This watch was made in 1981 to only 8 examples.The founders in 1974 of our auction House ?? Mr. Osvaldo Patrizzi, Watch Expert and Technical Director, and, Mr. Gabriel Tortella (1940- 2011), Administrative Director ?? created this model in order to offer it to some of their best friends and clients. In Autumn 1980, the Galerie d’Horlogerie Ancienne became Antiquorum; its head office moving to Geneva from 9, rue de la Corraterie to 29-31, Grand-Rue. Having an international reputation by organizing auctions in Geneva (since October 8, 1974) and Hong Kong (since May 28, 1979), the firm aged 7, can then afford this kind of gift. The watch, with 18K yellow gold water-resistant case, is fitted with a Valjoux movement. It’s Roger Dubuis (1938-2017), master watchmaker who has just established on his own, who is then responsible for the casing and adjustment of the watches. At the time, it is a piece worth 12,000 Swiss francs. The watch presented here comes from a Genevan antique dealer and gallery owner, a longtime friend of Gabriel Tortella. We thank Mr. Osvaldo Patrizzi for providing us with the information mentioned above.